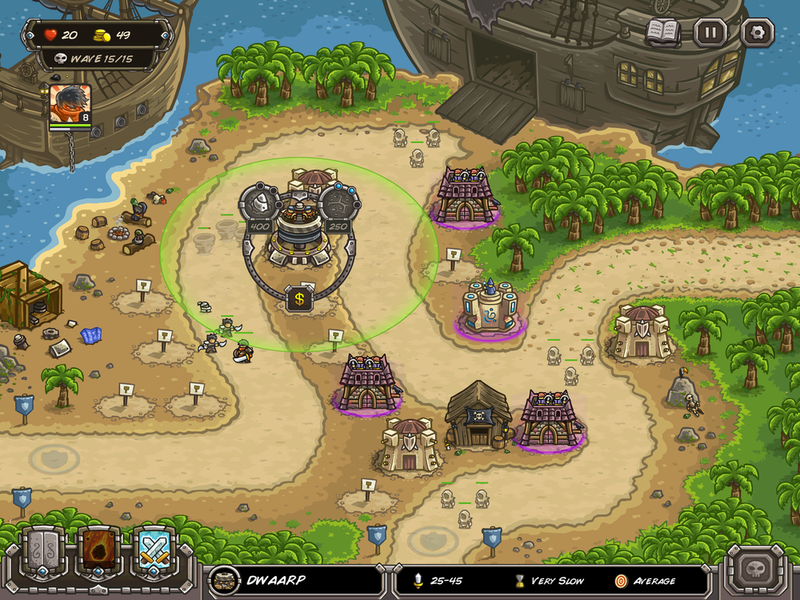 Kingdom Rush: Frontiers is an amusing tower defense game with enough customization options and neat little gameplay elements that makes it worth the 3.99$ price tag but also tries to catch IAP money through some other means that I can't say I care much about. KR:F is a good tower defense game. You have your paths and a few spots on which to build (some of them are covered with rocks that you have to pay 100 gold to get rid of, is that an incentive to buy gold for crystals?) and four type of towers. Archers, mages, explosives and soldiers. Archers shoot fast, mages are stronger and penetrate defenses, explosives have area of effects and soldiers block the enemies while fighting them. You can level each tower type three time, then you have to pick an upgrade, for archer towers, it's going to be throwing axes (with some totemic powers) or crossbows (with a critical hit aura and rapid-fire option) you also have a few spells, a meteor spell (on a significant cooldown) and a reinforcement spell that summons two units to block enemies and fight them off. The goal being not to let any enemy leave the map alive. With those stars, you can buy upgrades for your main tower types and your two spells. 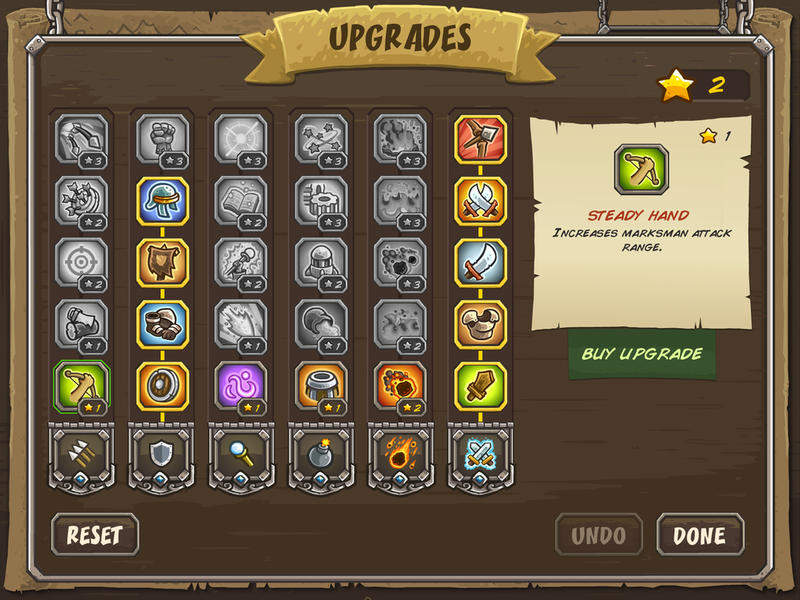 These upgrades also help you redo earlier levels easily and can change the way you play the game. I really like reinforcements and I like soldiers so that's what I boosted first and it's good to have meaningful upgrades. Beating the stages with 3 stars on the first try can be difficult at times and the game wants to trick you with 'gotcha' moments where you're just taken by surprise and can't do much. This is a bit annoying because opening new paths for enemies to come in when it's been the same for ten waves means you're probably going to let one or two sneak past and then retry to get it perfectly. Why not at least indicate that there are more paths in the map? Don't show where they are, just say that the map has surprises. And I can't help but feel that it's the way KR:F tries to make more money, by selling you powerful one-time use nukes that will help you win even if enemies sneak completely past your towers that you thought were well placed. 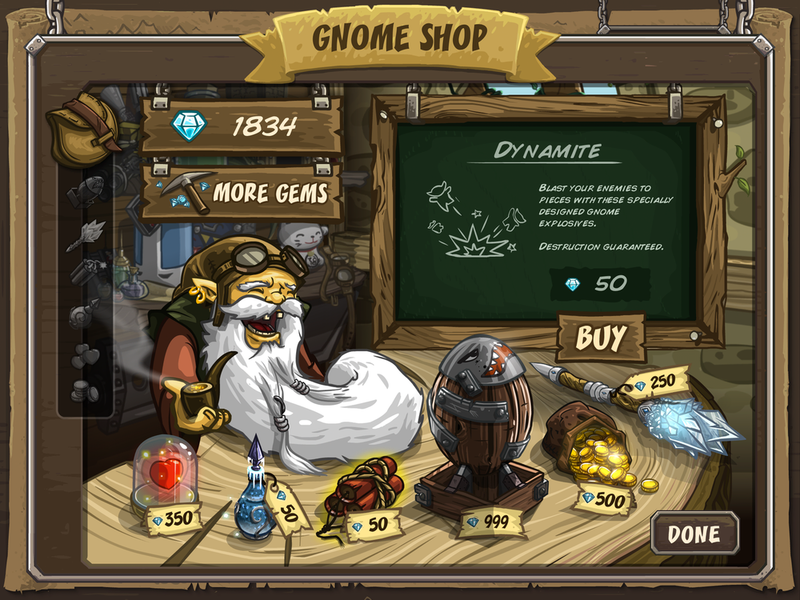 You can buy these things for crystals and you get them by playing the game but you can also pay real money for crystals. Things you can buy range from additional money in the maps to nukes that destroy everything on-screen. I don't mind the idea of having consumables in tower defense games but if I've managed to beat every level without them (not 3-star on the first try, but I've got all 3 stars after getting further in the game and coming back) what's the point besides getting money? Maybe you can cheat the really tough challenge stages with them, but if the strategy is either know exactly what to do or pay some money, it's not really strategy.